Welcome to week number 39 of Real Family Fun! I'm glad to have you here. I have some exciting news for you all. This weekend my blog is moving. I'm migrating over to WordPress and will have a new design and layout for you all next week! It is going to be beautiful…you are going to love it. In the spirit of all things new, next week, our link party will be at the same time and same place, but it will have a new name and a new look. Can't wait to show it to you next week. 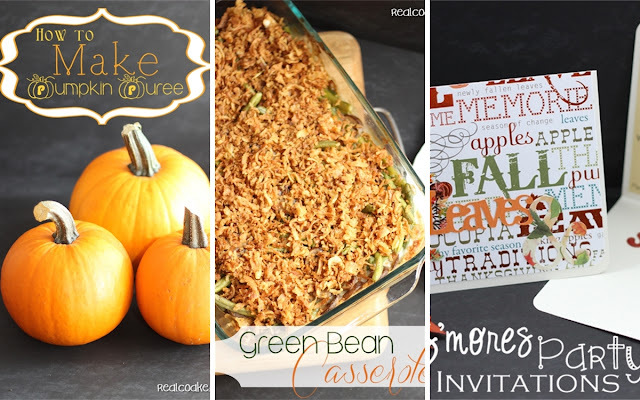 This week I showed you how to cook pumpkin, a delicious whole food version of green bean casserole, and cute invitations for a super fun family even we hosted – a Leaves & S'mores party. I've been feeling under the weather all week so far and I have a horrible migraine today, so I'm going to keep this short. I hope your week is going well thus far and I'm looking forward to seeing what you have been up to! Please grab a button from the sidebar and add it to your blog post or your link party page. Thanks so much! Good luck on your move to WP! I look forward to seeing your new design! Thanks so much! I can’t wait to show it to you! 😀 Have a great rest of your week. Look forward to seeing the new design, KC. Yay! I’m looking forward to showing it off. Enjoy your weekend. Congrats on the move to WordPress! Thanks for hosting !! Thanks! Glad to have you link up again this week. Looking forward to seeing your new WordPress format KC! Thanks for hosting another great party! Thanks, Marie! I’m looking forward to getting it all done and finished. Of course, the I think I will feel like new blogger again trying to learn it all again! lol! Glad to have you join the party again this week. Thanks! I’ll let you know how it goes…if that helps in your choice to move or not. Fingers crossed it goes well and I can figure it out! I hope everything goes smoothly with your move, KC! Thanks for hosting again this week! Thank you! I hope it goes smoothly as well. Thanks for linking up and joining the fun again this week.